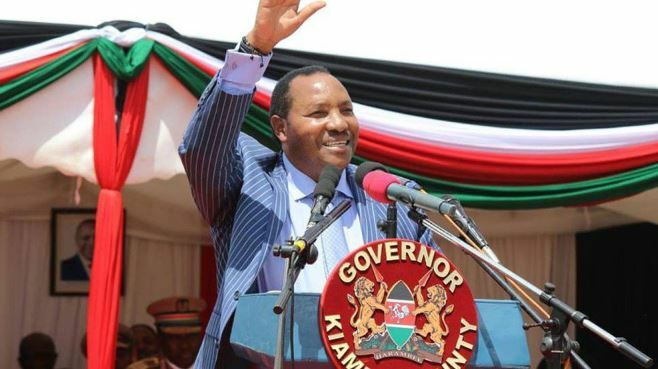 Kiambu County governor Ferdinand Waititu has urged his electorate to excuse his purported poor English, saying he did not attend nursery school. While addressing mourners at a funeral service in Gatundu South on Saturday, ‘Baba Yao’ acknowledged that he finds it hard to express himself in English. “I was a student at Dagoretti High School but as you know, I have difficulty in expressing myself English. This is because I did not go to nursery school,” said Waititu. “But English is just but a language, of importance is what is in one’s mind,” he said amid cheers and laughter from the crowd. Waititu thanked his supporters for electing him and assured them he will work to make a difference. Just last month, Waititu also spoke about his struggle with English reiterating that he is committed to service delivery. “Mimi ndiye baba yao. Some of you might have heard so many stories about me, some of them indicating that I cannot even express myself in English.